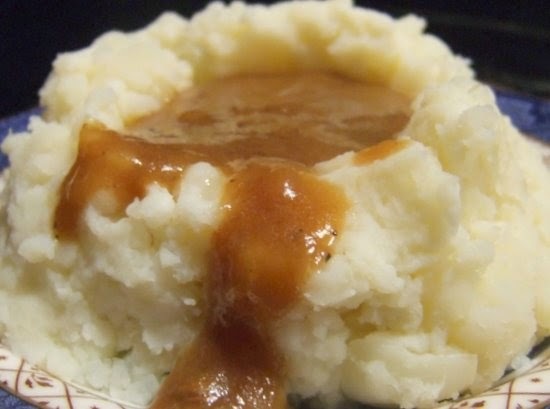 Who don't love mashed potatoes and gravy...? Well! not too many folk I know. 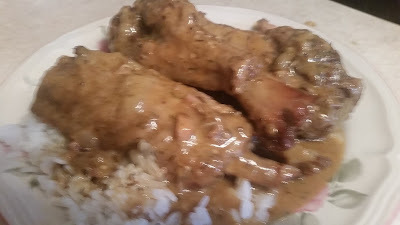 I got a good recipe for those potatoes and a great recipe for cajun gravy to put on top. cut potatoes into a large pot, cover them with cold water, and add salt. Stir in the warm cream a bit at a time into the mashed potatoes. mix well. Season with salt and pepper and gently fold in the chives. Serve hot. Popeye's famous Cajun gravy is no exception. Serve it over mashed potatoes, dirty rice, or chicken and you'll get that wonderful taste right at home. Heat vegetable oil in a large saucepan over medium heat. Sauté chicken gizzard in the oil for 4 to 5 minutes until cooked. Remove gizzard from the pan and let cool. Finely mince the gizzard after it has cooled. Combine ground beef and ground pork. Mix with your hands until well mixed. Add bell pepper to the saucepan and sauté it for 1 minute. Add ground beef and pork to the pan and cook brown. Mash meat into tiny pieces as it browns. Add water and beef broth to the saucepan, then immediately whisk in cornstarch and flour. Add remaining ingredients and bring to a boil. Reduce heat and simmer gravy until thick, about 30 to 35 minutes.